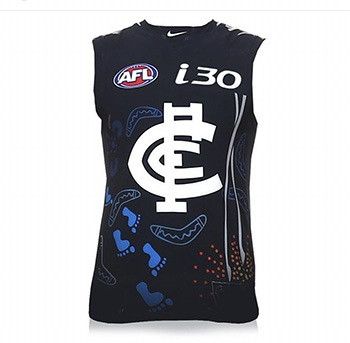 The guernsey was designed by Indigenous artist Trevor Pickett and serves to honour dual Carlton premiership player Syd Jackson. Depicting the life and story of Jackson, the front of the guernsey features seven boomerangs, representing the Roeland Southwest Native Mission on Seven Hills Road where he was taken as part of the Stolen Generation. The footprints on the guernsey showcase Jackson leaving alone on his journey to the east to pursue football and the five footprints symbolise the number five that he made famous when playing for the Blues. Jackson went on to play 136 games for Carlton between 1969 and 1976, which are depicted on the guernsey by 136 circles. He was inducted into the Club’s Hall of Fame in 2006. Proceeds will be going towards Carlton's Syd Jackson Scholarship which aims to increase the education and employment of Aboriginal and Torres Strait Islander young people. This guernsey is individually signed and match-worn and will be presented in a limited-edition display tin, accompanied with a Certificate of Authenticity issued by the AFLPA.